In recent years, Acacia’s focus on building and industrial products has increased markedly. Our product range expands regularly with both custom products and Acacia’s own designs. We are always ready to meet with new clients, to discover their needs and apply our design and manufacturing experience to create the products that best suit their market. 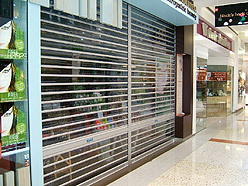 We are the Australian market leader in polycarbonate and PMMA infills, for security doors. We produce a range of sizes and profiles for use in both horizontal roller and vertical concertina doors. We currently produce widths between 45 and 150mm, with and without beads. Standard infill is clear, but opaque and colour tinted versions can be manufactured to customer specification. These products are sold Australia wide, and exported internationally. Acacia also produces numerous extruded polycarbonate skylight panels for metal awnings. Panels are designed to snap fit into metal lengths, creating flexible domestic awning systems for all weather conditions. Acacia can manufacture these panels to a maximum width of 350mm. Our design experience has proved invaluable in the development of the highly complex profiles required by our customers.